Summer Balance News – Playtest Open Now! Greetings, Card Hunters! Today we’re unveiling our latest balance work. Note: none of this is live yet; it is all on the test server, where we are conducting a public playtest of these changes. Until we have finished this process, none of the following changes will be considered final. I’ll go over the changes first, then explain how you can contribute to the playtest. Before I get into the meat here, I should clarify our goal. The goal is to deal with problems. What qualifies as a problem? 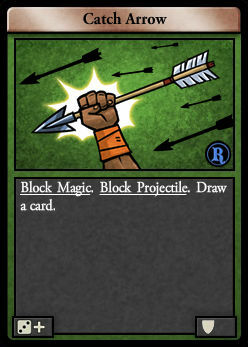 Cards or whole strategies that are huge outliers in terms of power or how unfun they are to play against, for instance, or item slots for which all players use only one or two different items. 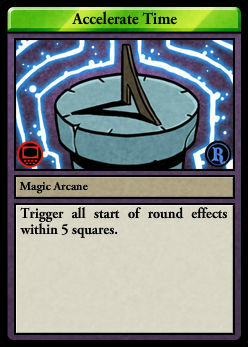 We are not trying to rationalize the ratio of quality to power for every card. We are not trying to create a flat power curve. We could fine-tune endlessly, but that’s not the point. There are a lot of items in Card Hunter that aren’t competitive and we aren’t trying to change that today. We’re always very careful when nerfing cards or items and will do this only when we don’t feel we have other options for dealing with a serious metagame problem. The following changes have been made based on a combination of data analysis and attention to user feedback. 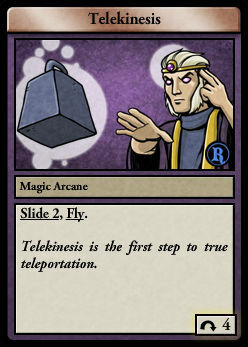 Telekinesis has been one of the least fun cards for our players to play against—on certain boards. Unfortunately, its ability to put characters on the other sides of walls translated into a real design constraint for us when we’re making boards for ranked play. 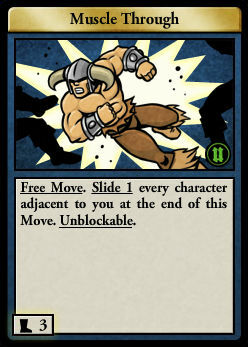 With Fly instead of Teleport, this card retains most of its fun and power—you can still move characters over water, enemies, etc.—while losing the aspect that made it obnoxious (and undervalued!). Elven Maneuvers was designed at a time when elves were much worse than other races, in part due to dwarves’ ability to fly halfway across the map with a single Nimble Strike. 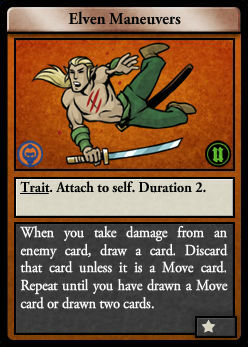 The environment has shifted many times since then, and it’s become hard to justify this card’s power level. 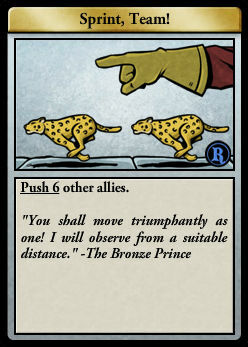 While reducing both the duration and the search depth may seem like a hefty nerf, the new version of this card is still both A) quite powerful in the right deck, and B) undervalued for a bronze card. We expect these changes to make Elven Maneuvers less oppressive to face while also making it possible for us to introduce Elf Skill items in the future that are playable without needing to meet an impossible bar. While we’re talking about skill items, the Arcane Skill slot has been extremely unhealthy as a result of Electroporter Novice, the only tokenless 3-trait item in the game. 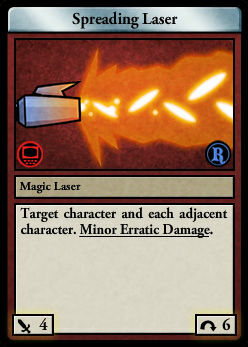 We are replacing that item’s Spark Generator with a Powerful Spark. Electroporter Novice remains a level 8, tokenless item. 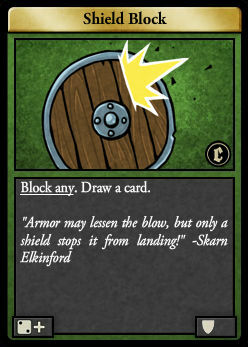 Parry and Defender’s Block are known to be best in class, and our data reflects this with very few shields seeing play besides Parrying Buckler and Aegis of the Defender. 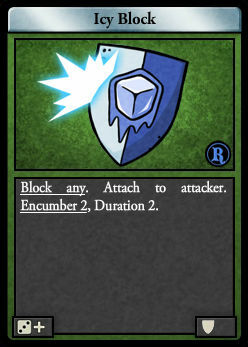 Buffing these three blocks—reducing the required roll across the board, in addition to making Shield Block draw on any block—will edge more shields toward playability. We’ve all heard our share of complaints about builds built around Volcano. Accelerate Time isn’t a constant feature of these builds, but making it require some vestige of positional play will improve interactivity and give more builds counterplay options. “Burfft”—builds mixing damage buffs with area-of-effect Burst Attacks—has been a particular scourge in the game recently. Our data showed that using more Searing Pains and Skulls of Savage Iljin was the biggest factor in improving your rating past 1400, by a wiiiide margin. Obviously, this is problematic because it not only reflects imbalance producing monoculture, but burfft isn’t even usually fun to play against: because of how these attacks go around corners, it’s incredibly tricky to “play around” burfft. We discussed this issue at length internally, and paid close attention to both game data and player feedback. In this balance pass, we are only changing two cards. Savage Curse‘s damage addition to magic attacks is getting halved here (worth noting it’s still TWICE the effect of other paper quality damage buffs). 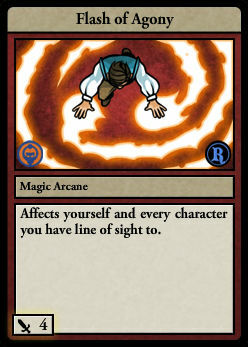 Flash Of Agony can have devastating damage output, and is relatively easy to position for optimal effect; making it self-damage will be a small nerf that increases players’ need to think about how and when to play it. We know these two changes won’t solve the problem outright, but they should ameliorate the situation while we work on a more thorough solution (keep reading!). 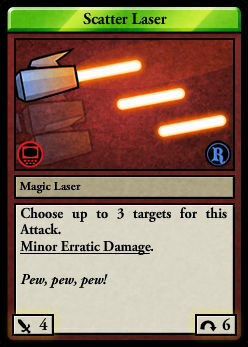 We’re bringing up the minimum damage on these emerald quality rare laser attacks to better justify their quality and provide more interesting Staff choices. 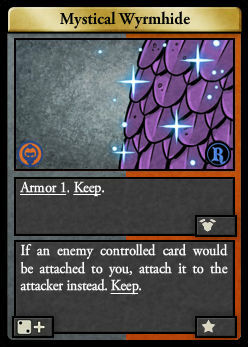 For the mystical hides, we really wanted them to be more reliable. When you equip them, you’re including them as counters, so they should function as counters. With a 2+ roll for their secondary triggers, you’ll now be able to count on them to serve their purpose more often than not. The above changes don’t address every known issue with our competitive environment, but they will begin to deal with many of the worst problems. They aren’t all we’re doing, though! 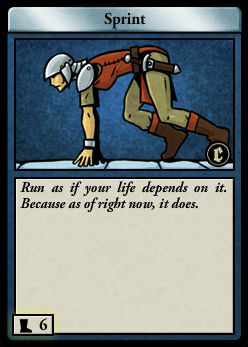 Blue Manchu is pleased to announce that we are already working on a new set of cards and items, which are being designed around the twin goals of giving players more fun toys AND addressing remaining issues in the environment. We can’t say more right now, but this work is already underway and we’re very excited! The above changes are all implemented on our test server and you can check them out today! If you haven’t used the test server before, read this guide to get started. The test server will remain open for testing for a couple weeks at minimum. During this time, we will be collecting feedback. How to Give Feedback: start a conversation with Flaxative on the forums. You can discuss the changes with other players in the Summer Balance forum thread. Nature of Desired Feedback: we are not looking for snap judgments of these changes, nor any considered opinions from the armchair as it were. We want feedback from players who are testing these changes. Feel free to discuss your feelings about the changes with other players, but when submitting feedback to Flaxative please only do so on the merits of competitive games you’ve played on the test server. Rewards for Testing: When you send Flaxative feedback, include your in-game username. Every playtester will receive 80 pizza, enough to buy a costume from Cuthbert’s. Additional prizes may be distributed at Blue Manchu’s discretion to players who identify serious issues or otherwise contribute materially to the success of these balance changes. Thank you for reading. Now go get your feet wet on the test server and let us know how it goes! • Raging Battler: Replace Reliable Mail with Toughened Hide Strips. • Apprentice Ferocity: Replace Desperate Block with Unreliable Block. 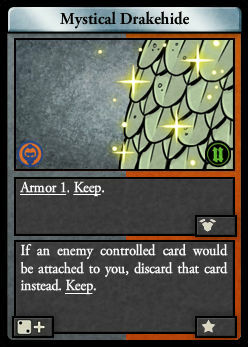 I cant wait to try these new cards and combosand dust off some of my old staves / armor / shields that never got the love they deserve. Fantastic! All of these changes seem spot on (with some mild skepticism related to Flash of Agony sine that will make quite a few staves unplayable). Nevertheless, solid choices I’d say. Happy to see wyrm hide finally getting a chance to be played. Instead of doing self harm with flash, Make the user of the flash temporarily disorientated. E.g Should the person doing the flash wish to move during that go, they move in random direction. That fix for Wrymhide is long overdue. I was so excited when the card came out and then after it’s really high fail rate I quit using it altogether. Thanks! I am so impressed with the effort you all put into this game, including the balancing aspects. Plus, you write well! Good work! For Savage curse, do you really want to reduce it from 4->3? 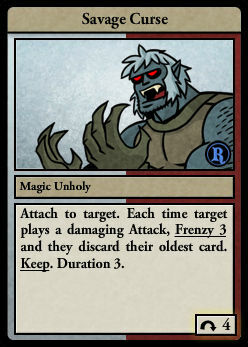 Making it frenzy seems like it would be enough and not too much of a nerf. Losing a card is big. every time I tried to leave feedback/suggestions for this game there is always some poster that come in and undermines the suggestion as not needed, or frivolous or in their opinion, a non-issue. it becomes tedious and demoralizing to the point where I don’t feel like participating in the forums anymore. Wish it to be like Hearthstone, when there a nerf you have X days to sell your items back at full price, so you do not feel soo much that you just got your time/work/items stolen.